Districts can create content-specific Item Banks for use in Item Bank Assessments. 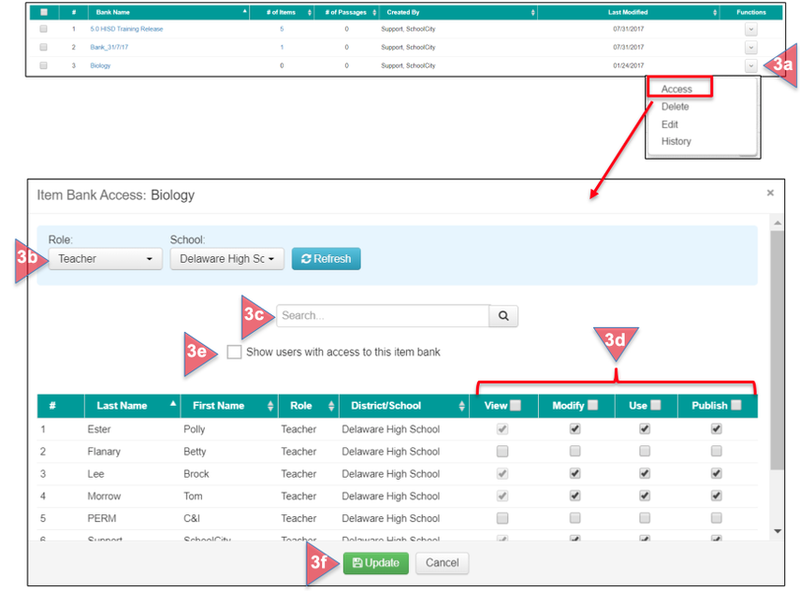 For example, in a high school, each department may want to create items and/or passages for a World Languages Item Bank, or a Chemistry Item Bank. Users with District Item Bank Access permission may grant other Users access to these banks within the Item Bank module in order to work collaboratively on Items and/or Passages. 1. From the Top Menu Bar, select Item Banks. a. District Work Space: A place to create Items and Passages for a District Item Bank. b. My Work Space: A place to create Items and Passages for a personal Item Bank, which can be moved to the District Bank if needed. c. Create Bank: Create a new District Item Bank. d. Similar Item Search: Find previously created Items and Passages that meet a specific criteria. e. Search Criteria: Select filters to find previously created matching banks. f. Item Banks: Bank Name, Number of Items, Number of Passages, Created By, Last Modified, and Functions. g. Functions: Click the down arrow to grant Access to the chosen Item Bank to other Users who have previously not had permission to use the bank, Delete or Edit the Item Bank, and view the History of the Item Bank. a. Click on Access to open a window displaying the list of all district users. b. Search for a specific Role and School, then click Refresh. c. Search for a specific User by using the search box. e. Check the box to show users who already have access to this item bank. f. Click Update to save your selections. The specific users now have access to the bank according to their granted permissions.